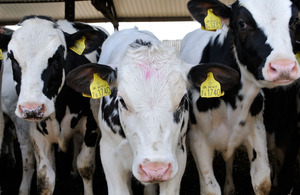 Leading experts on bovine TB will host Twitter Q&A sessions. Over the next three weeks leading experts on bovine TB will be hosting Q&A sessions via the @DefraGovUK Twitter account to answer your questions about the disease and the action being taken to stop its spread. Themes: History of the disease in England, the impact of bovine TB and the measures used to prevent it’s spread. Nigel was appointed in May 2008 following previous experience in the State Veterinary Service and in policy roles on international trade, BSE controls, animal welfare and international relations co-ordination for Defra’s Food and Farming Group as well as Government veterinary services in Belize and Yemen. Nigel worked in private practice in his early career, before joining the UK government services in 1990. Glyn Hewinson graduated in microbiology from Bristol University, UK, and obtained a Ph.D. in microbiology from the University of Oxford, UK. In 1996, he was appointed Head of the TB Research Group at VLA Weybridge, UK. His group was also responsible for the molecular fingerprinting of Mycobacterium bovis isolates for epidemiological purposes. This has resulted in a growing interest in the molecular evolution of M. bovis. Glyn was leader of the M. bovis genome-sequencing project and is a visiting professor at Imperial College, London, UK. Professor Ian Boyd’s is a member of the Scottish Science Advisory Council and is on the Board of Reviewing Editors of Science. Professor Boyd has received numerous honours and awards recognising his contributions to science, including the Scientific Medal of the Zoological Society of London, the Bruce Medal (awarded once every 4 years) for his research in Polar Science and has been elected as a Fellow of the Royal Society of Edinburgh, Scotland’s National Academy, and is a Fellow of the Society of Biology. If you are unable to take part, you will be able to read a Storify summary of each session on the Tackling bovine TB blog. 5 April 2013 First published.